Here you can see the original still-life on the bright red background. It is almost ready to be removed from the hoop right now. This stylish attractive young girl is the real sewing fairy with all her necessary accessories. They are scissors, thread, needles and meter band. 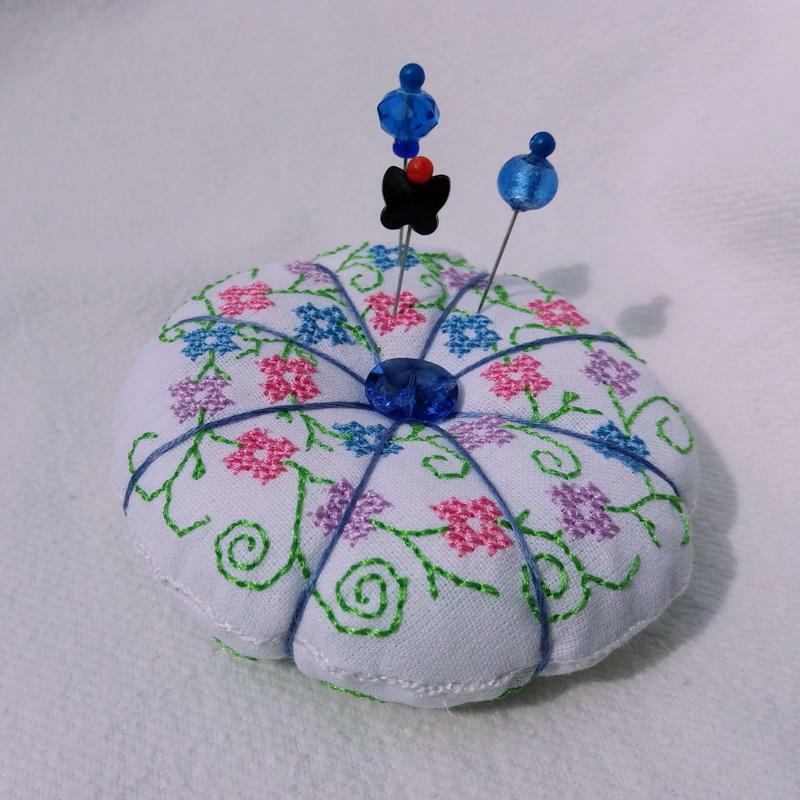 Sewing fairy embroidery design is the nice option for decoration of the box or any other capacity for storage of accessories for needlework. I am searching for free software website for the purpose to change my vector art from .ai, .eps or other preparation in to sewing machine setups such as .jeff, .sew, .dst and many more. I heard about wilcom which is awesome but costly. I want to try this out and to perform customs designs for family and friends. Hey, I am searching for help. And, can you help in operating with illustrator, fireworks and Photoshop or other program? There is the original postcard which will definitely please the person who likes to create handmade work piece. Instead of traditional paper background it has fabric of light grey color. Furthermore it has thematic design on its front side. 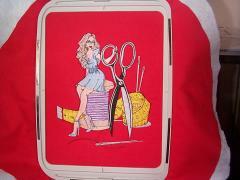 It is Needlework set embroidery design which includes all necessary things for needlewoman. They are needle itself and also thread, the tape and scissors which are surrounded by the beautiful red flowers. 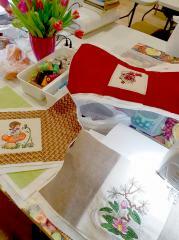 Each of us wants to have our own sewing-embroideyr corner. That he was comfortable, functional and beautiful. Let's show here our handmade corners, dream about which handmade corners and even workshops we would like to have and learn from each other useful experience. I would like to summarize the experience gained by users, at the choice of embroidery and sewing embroidery machines and additional equipment for them. This picture shows the process of work on the masterpiece based on Grouchy owls embroidery design. The main contours and color scheme of both characters of this embroidery sample are already clear. But the author still has to finish the head of the main bird and some little details. The image perfectly shows that some elements of this picture are executing in some steps. So the body of the owls also requires some more work. 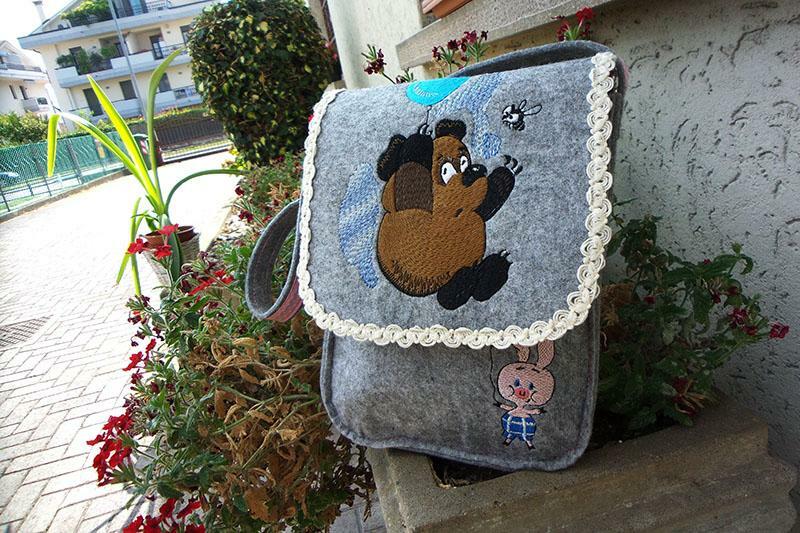 In video process in hoop Teddy bear with watering can embroidery design. Happy Japan embroidery machine. Real video with sewing process. Teddy Bear machine embroidery design from our Teddy bear embroidery collection. 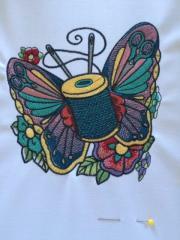 Final embroidering Dreamtime lady embroidery design. In happy embroidery machine. 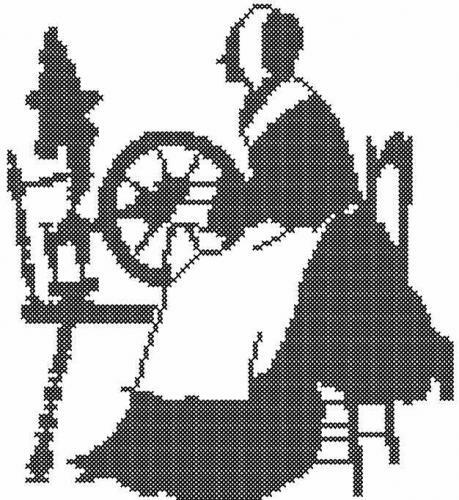 It is the funny picture which can be used for decoration of any textile accessories connected with hobby or handmade things. 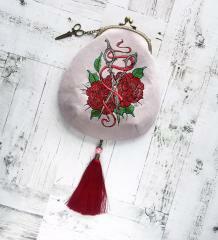 Here you can see the small squirrel which makes the embroidered band with red hearts using old style sewing machine. It is not enough tall so it need to take the bobbin of thread to achieve the working surface of sewing machine. 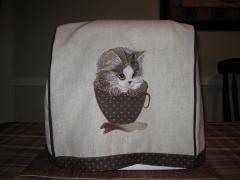 Squirrel sewing machine embroidery design is the picture which requires some skills and humor. 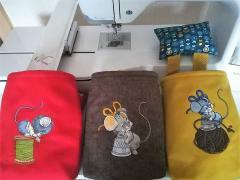 It is the case for storage of sewing machine. The bright pink color of its background is added with some funny embroidery samples made on the separate pieces of fabric. 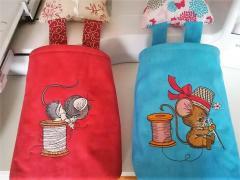 All of them are devoted to the hobbies connected with different manners of sewing — with machine or with hands. The main of them is Sometimes a girl's just gotta sew machine embroidery design, the other one is Hand made machine embroidery design.